What counts as a paper clip? For purposes of the discussion and timeline presented here, a paper clip is a flat or nearly flat piece of metal that slides over an edge of a set of papers and holds the papers together without being bent or pinched by the user and without piercing the papers. A large majority of different paper clip models were made by bending single pieces of resilient spring steel wire. 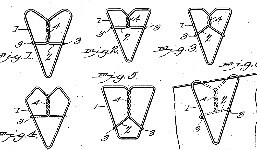 Three others were stamped from sheet metal (Eureka, Sheet Brass Gothic, Proco) and another four (Angell, Utility, Vise, Acme Correspondence) were made by folding small pieces of resilient sheet steel. 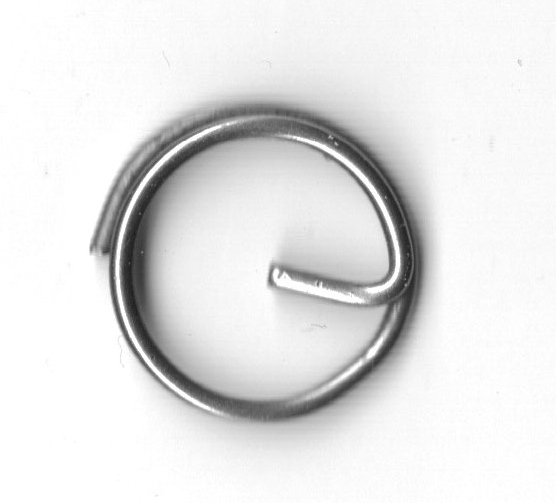 One (Nifty) was made by bending a wire into a spiral and then flattening it. Recently some paper clips have been made of plastic, but these are not covered here. 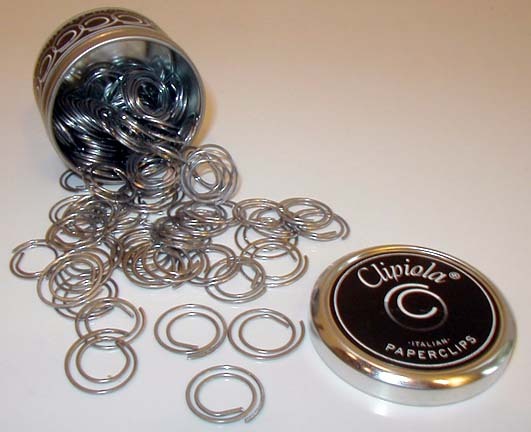 During the 19th and early 20th centuries, the term "paper clip" was also used to refer to a spring loaded clip that was generally two or more inches long. 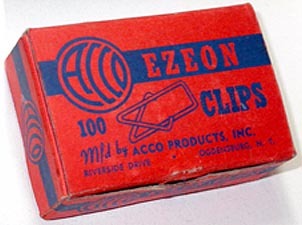 This type of clip was also called a "letter clip." We consider these devices on our web page dealing with small filing devices. When were paper clips introduced? The first paper clip was patented by Samuel B. Fay in 1867. This clip was originally intended primarily for attaching tickets to fabric, but the patent recognized that it could be used to attach papers together. We have found no advertisement for, or other mention of, the Fay design until 1896. 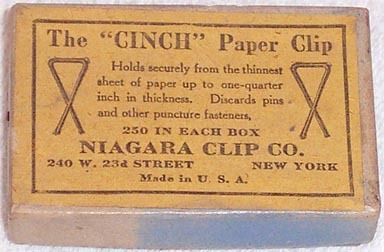 In 1896, the American Stationer announced that D. S. Gorman was the New York, NY, distributor for a "new paperclip," named "Clinch;" this clip used the Fay design. 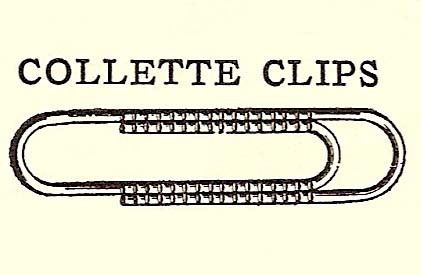 Also in 1896, the Cinch Clip Co., Buffalo, NY, was identified as the manufacturer of a paper clip named "Cinch," which also used the Fay design. It therefore appears unlikely that paper clips with the Fay design had significant, if any, sales prior to 1896. However, beginning in the late 1890s and for decades thereafter, the Fay design was widely advertised under many brand names for use in fastening papers. 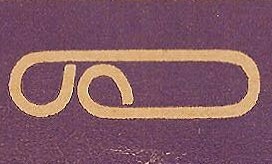 In 1918, the brand name "Fay" was used by the American Clip. 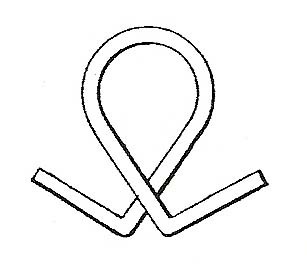 Co. for a paper clip with the Fay patent design. 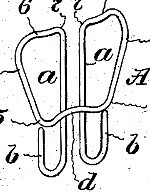 A second paper clip design was patented by Erlman J. Wright in 1877. This clip was advertised at that time for use in fastening newspapers. A third paper clip was patented by Frank Angell in 1889. 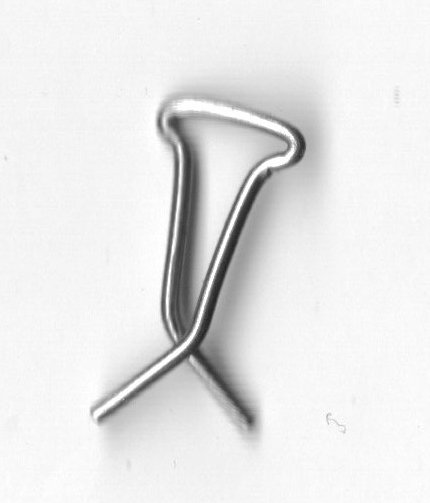 The Gem paper clip, which was never patented, but which became by far the best selling paper clip in the U.S., was introduced in 1892 and has been advertised since 1893. In 1904, when Cushman & Denison applied for a trade mark for the Gem clip, the company stated that it had used the Gem brand name for clips since 1892. And in a 1922 advertisement for the Gem paper clip, Cushman & Denison stated, "Thirty years ago we placed on the market the first 'Gem' Clip." Speculation that the Gem paper clip originated in Britain by the early 1880s is incorrect. This speculation is based at least in part on references to "Gem Paper Fasteners" in publications dating from 1883 and 1884; these publications did not contain either illustrations or verbal descriptions of these fasteners. However, the Early Office Museum has found an 1881 publication with an illustration that shows that Tower's Gem Paper Fasteners were staples with legs that were bent toward each other after they were manually inserted through slits cut in papers. They were not paper clips. When did paper clips come into widespread use in offices? A patent application filed at the end of 1896 indicated that a number of different paper clips were in use. A flood of paper clip patents were issued beginning in 1897. A 1900 trade publication stated that "The wire clip for holding office papers together has entirely superseded the use of the pin in all up-to-date offices." (Business, March 1900, p. 173) This evidence indicates that paper clips came into widespread use in U.S. offices in the late 1890s. With what products did paper clips compete most closely? 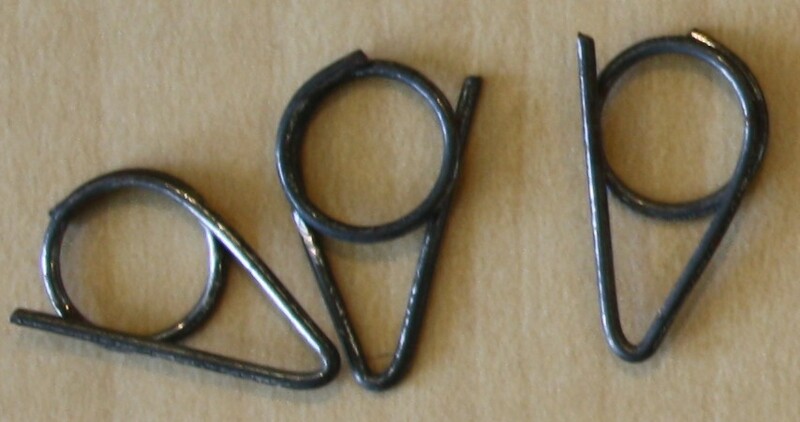 The two earliest patents indicate that bent-wire paper clips could be used in lieu of pins, sewing, "pointed bent-over paper fasteners," and eyelets. 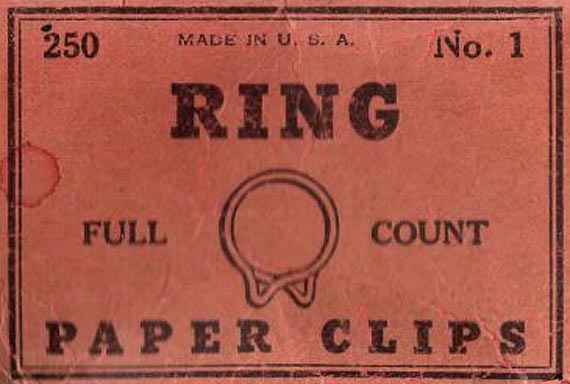 In 1904, Clinch Clips were advertised as "Cheaper than Pins." 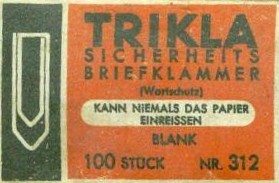 Around 1910 advertisements compare paper clips to straight pins for temporary attachment of papers. 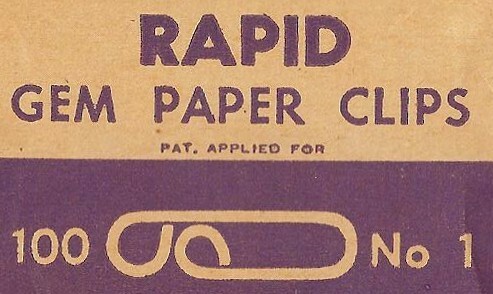 By contrast, early paper clip advertisements do not refer to staples. What is included in the paper clip time-line below? 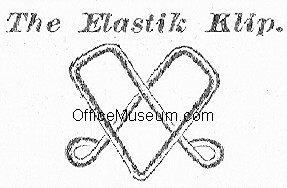 The Early Paper Clip Gallery below identifies every paper clip that we are aware of that has a patent date before the end of 1902 plus every one for which we have found an advertisement, box, or example (but excluding modern plastic and decorative paper clips, e.g., ones in the shape of a bone or star). Many additional designs that are not shown here were patented. Presumably most of these were not advertised widely or for long, if at all. 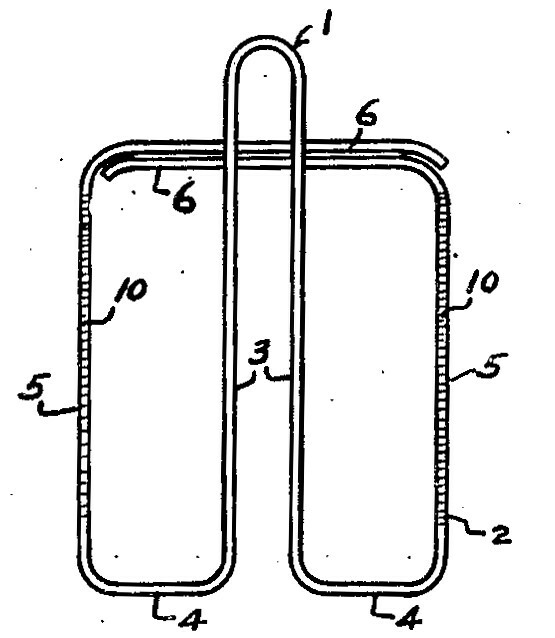 In the case of paper clips patented before the end of 1902, if we do not have an advertisement or box that tells us the brand name of the clip, we have identified the clip using the patent holder's last name in italics. 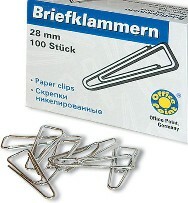 We did not include paper clips that were patented after 1902 unless we could find evidence that they were produced. We used that cutoff date because 13 paper clip patents were awarded in 1903, 10 of them to one inventor, George W. McGill. Of the latter 10, only three appear to have been produced (Banjo, Ring, Improved Gem). Where did the Early Office Museum obtain the information on this web page? The information on this page is based on our review of patents, early trade publications, artifacts, and other primary sources. As a result, unlike much of the information on the history of the paper clip that is available on the internet, the information presented here is accurate. The Early Office Museum is grateful to Kenneth R. Berry for sharing his patent and trademark research on paper clips. Would you like to swap, sell, donate, or purchase early paper clips? If the Early Office Museum has an example of a particular paper clip, we put an "X" at the end of the text in the box in the right-hand column in the pertinent row of the table below. We have duplicates of most of those, but not all. 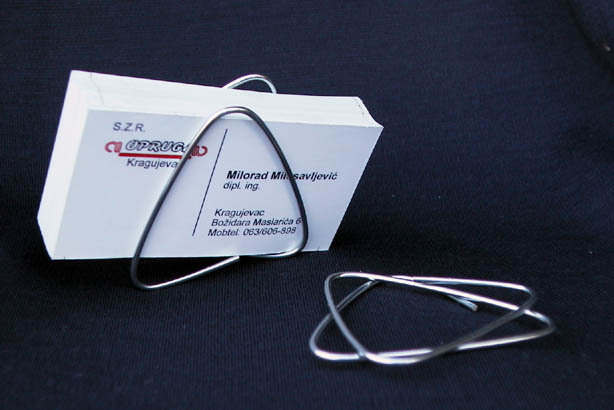 We would be happy to swap our duplicate early paper clips for ones we do not have. We will also sell duplicates, and we will purchase or accept donations of ones we do not have. We are also interested in photos/scans of paper clips, boxes, and advertisements (if possible dated) that we do not have to post on the Museum web site with a credit to you. Please email the Curator: eomcurator, followed by @, followed by hotmail.com with the subject line "paper clips". An X at the end of this box indicates that the Museum has an example of this clip. Advertised 1896 (as Clinch)-1961 The patent awarded to Samuel B. Fay described this clip as a ticket fastener to be used, in lieu of a pin, to fasten tickets to fine fabrics. 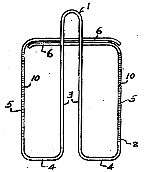 The patent noted that the clip could be used to attach a paper ticket to another piece of paper. 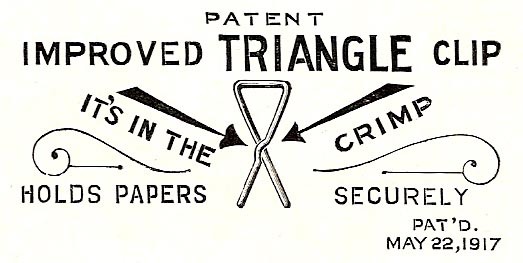 Advertised c. 1877 The patent awarded to Erlman J. Wright stated that the clip was designed for "fastening together loose leaves of papers, documents, periodicals, newspapers," in lieu of sewing, "pointed bent-over paper fasteners," or eyelets. The clip was advertised as a newspaper clip. The patent for this clip is titled "Book-Leaf or Paper Holder." However, the patent description states that one of its uses is to "hold together two or more pieces of paper--as, for instance, a letter and check received together." 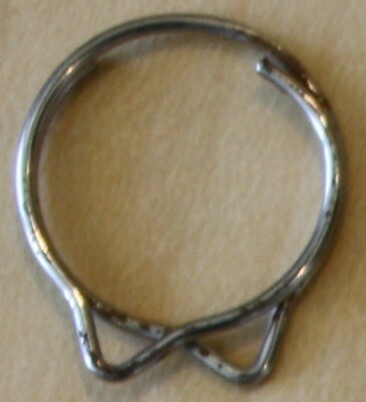 The patent states that this item consists of "a piece of flat metal bent or folded to form two lips of unequal length, the shorter lip curved upward and the longer lip flat." The scan to the left shows the shorter, curved lip (the right side of which bulges toward you as you view the scan) in front of the longer, flat lip. O. W. Smith Manufacturing Co. Detroit, MI. and subsequently Stationers' Mfg. Co. Detroit, MI. 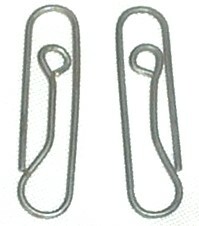 In 1904, Cushman & Denison obtained a trademark for "Gem" used in connection with paper clips. The announcement of the trademark stated "Used since March 1, 1892," so it is probable that the Gem Paper Clip was introduced on that date. August 1894 ad. All rights reserved. 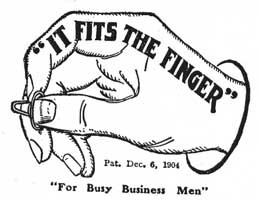 The earliest known Gem paper clip advertisement, which was discovered by the Early Office Museum, is in the September 1893 issue of The American Lawyer. The seller was Cushman & Denison. Advertised 1893-1900 Distributed by the Library Bureau, Boston, MA, which claimed that these spring clasps "largely supersede pins, staples, paper fasteners, rubber bands, clips, and all devices for fastening papers or cards together." Image from online article by Alan Walker, Processing Archivist, National Archives, College Park, MD. 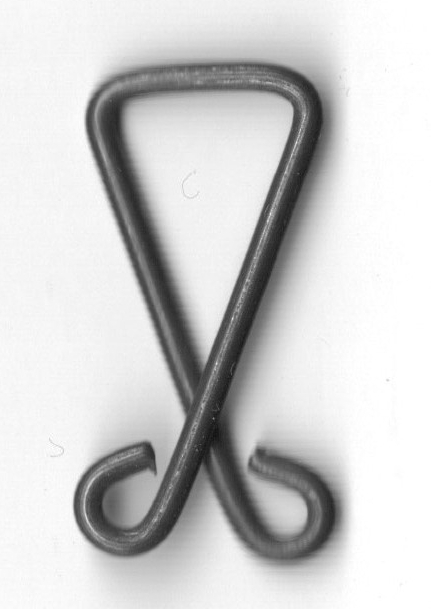 Made from sheet metal, not bent wire, by Consolidated Safety Pin Co., Bloomfield, NJ. Larger version sold as Giant Niagara Clip. Advertised 1897 "Holds securely from one to twenty thicknesses." 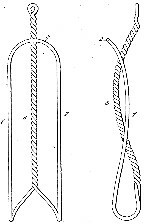 Patented 1897 The patent indicates that a number of bent-wire paper clips were already in use when the application was filed in December 1896. "Previous to my invention various forms of bent-wire clips have been used. Some of them do not grip the articles with sufficient force, while others endanger a tearing. Others are difficult or inconvenient, and others still are clumsy or have some portion projecting transversely to the plane of the papers." Made by M. P. & J. R. Schooley, Homestead, Pa. Advertised 1899 Columbia Manufacturing Co. Successor to the Scientific Clip Co. 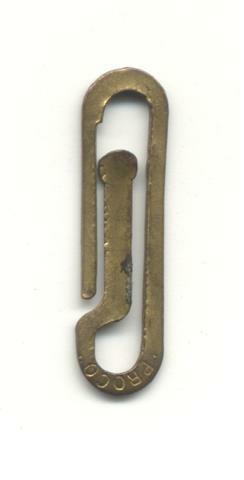 In 1903, the Clipper paper clip was available in brass or steel. in the 1901 US patent. 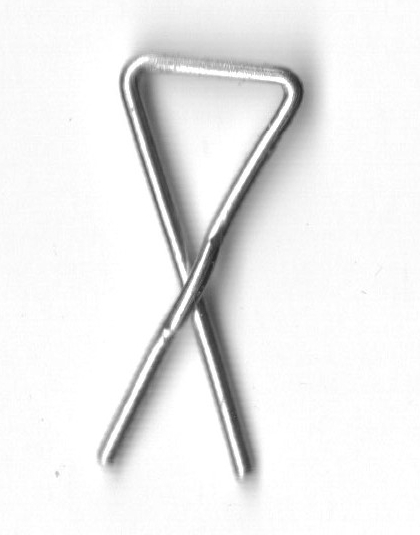 Vaaler, who was Norwegian, is commonly but incorrectly given credit for invention of the paper clip. His designs were neither first nor important. There is a large Gem paper clip statue in Norway. Norway might consider giving it to the U.S.
"A pin, paper clip and paper fastener in one." 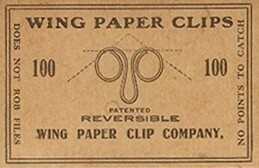 Patented 1901 The inventor of this paper clip, Frank E DeLong, and his brother owned the DeLong Hook & Eye Co., Phildelphia, PA. The company's main line of business was hooks and eyes for the garment industry. 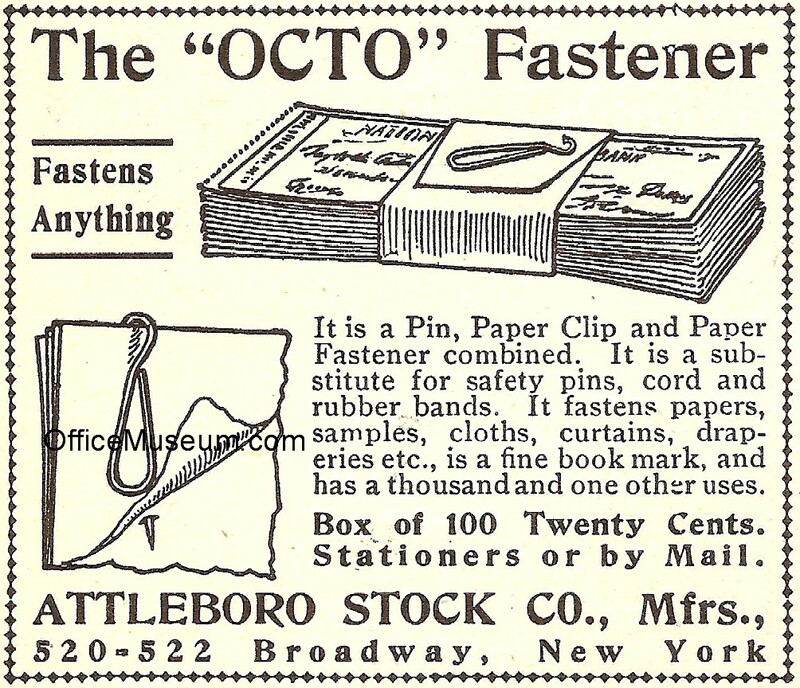 During 1912-21, this company sold the Twin Grip paper fastener based on a 1908 patent. ACCO Brands, part no. ACC-72130, as of 2013. 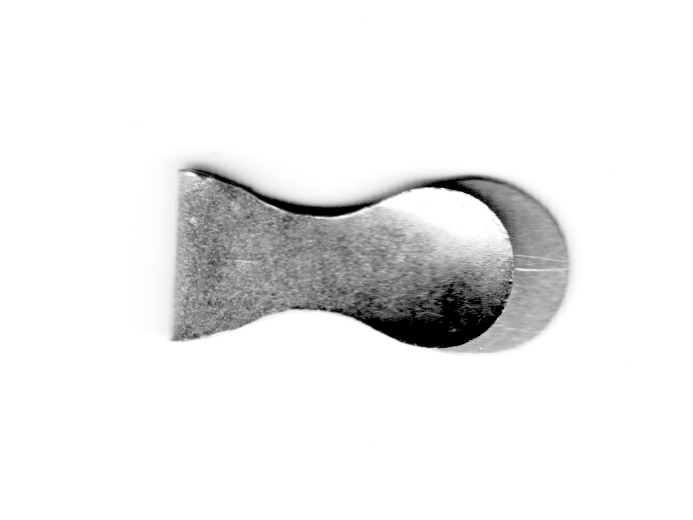 "An inexpensive clip that grips flat in four places. 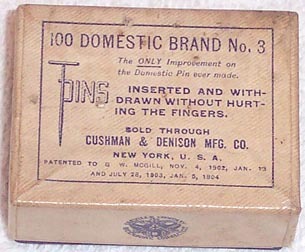 Does not slide under papers"
Advertised 1909-41 Cushman & Denison Mfg. Co.
Cushman & Denison Mfg. Co (Ring). 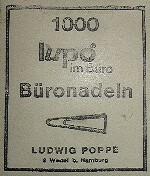 The Rinklip advertised in 1905 had a flat top. Advertised 1909-24 Cushman & Denison Mfg. Co.
with essentially this same design. Advertised 1904-25 Jackson Mfg. Co., Jackson, MI. Advertised c.1906, 1908-10, on market 1918 Clipper Mfg. Co.
As of 2016, being reproduced with thin brass wire. Advertised 1910 Tower Mfg. Co. catalog, 1910. Illustrated in Webster's New International Dictionary 1934. Dennison Mfg. Co. Advertised 1910-41 Cushman & Denison Mfg. Co. This type of clip had many equi-spaced perpendicular serrations on the long sides only, not on the ends. Serrations are designed to hold papers securely. This type of clip had many equi-spaced perpendicular serrations all along the wire, not just on the long sides. Widely used on European continent . 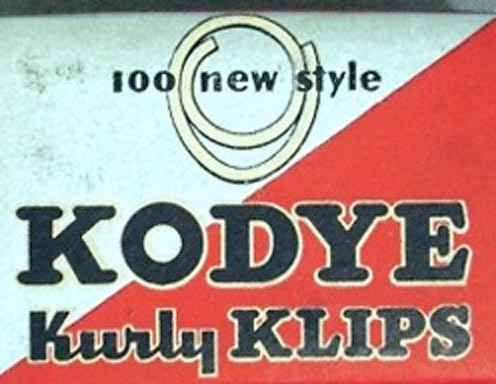 The shapes of the spirals vary among brands. .
Left: Kodye Kurly Klips. 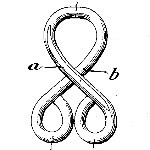 Right: Clipiola. 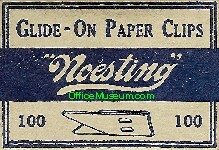 Acme did not have the small indentations that the Glide-On (see images) has. Sava (France), Polar (Germany), Ckpenky (Latvia) . We have misplaced the name of the person in the Netherlands who donated these. Additional paper clips are listed by name but not illustrated in Who Makes It and Where: The Stationers' Book of Knowledge, 1918-19, Andrew Geyer, Inc., New York, copyright 1916. Also, "You are Cordially Invited to a Preview of the Emanuel Fritz Paper Clip Collection at the Smithsonian Institution, Washington, D.C.," American Collector, July 1973, contains photographs of portions of several paper clips that are not included above. Because the complete clips are not visible, we are unable to match them to patent diagrams. Matt Boytim writes: "My buddy and I were students in the early 80's. We commuted to school and parked in a lot with meters. Being poor college students we were interested in feeding the meters with something other than money, and we had heard that you could use 'paper clips'. Of course, this made no sense to us until my buddy bought a box of Nifty Clips. We put a Nifty Clip in the dime slot of the meter, and a penny in the nickel slot, and wind the meter up to 4 hours. This worked because the nifty clip was slightly bigger in diameter than a dime and acted as a spring. It would compress to fit through the dime slot and once through would expand to engage the timer when you turned the knob. The penny was needed, I guess, because something solid had to be in one of the coin slots. We went to get more clips from an office supply store. When we paid, the guy said, 'So these things still work in the parking meters.' We did this for about two years, until they raised the price of parking and removed the dime and nickel slot. If you really care I can tell you what we did after that, but it had nothing to do with Nifty Clips."